Algae are the oldest known plant form on earth and the most abundant form of marine life – with about 73,000 species worldwide. 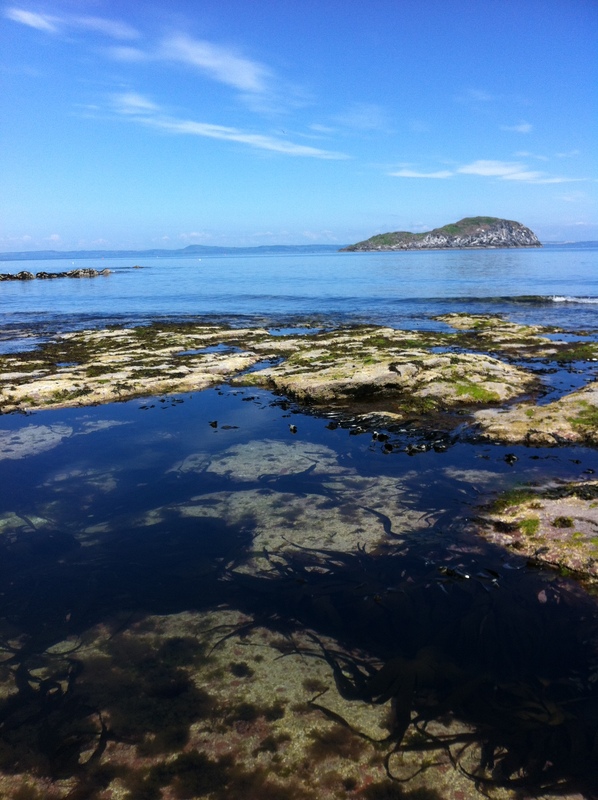 We have over 650 species growing along our 12,000 km coastline from the huge deep water kelps to the multitude of wracks, reds and greens that sprawl across the rocky shores, inlets, bays and beaches, as well as the microscopic colonies that blanket rocks and stones at the water’s edge. Generally simple unicellular or multicellular autotrophic organisms, virtually all use photosynthesis to survive, and collectively they produce more oxygen than any other plant form (over 50% of the earth’s oxygen). We usually associate algae with sea water, but there are many that live in freshwater and even those that prefer snow and ice; some are even found growing on trees in the forest. Algae can take many forms, the ones we most commonly see will be filamentous, gelatinous, fibrous, cartilaginous, encrusting or coralline. Seaweeds (macroalgae, primarily) grow from their tips rather than their base (usually just a holdfast) and are found where the substratum provides a solid footing and currents draw in and out to bring them fresh nutrients. This type of environment allows rapid growth and the larger seaweeds such as kelp, will grow quickly, turning the sun’s rays into chemical energy five times more efficiently than land plants. Red (Rhodophyta) – about 6-8,000 species worldwide. Rhodophyta have been determined to be actual ‘plants’. Unusual, as some are calcified (and thus important partners in coral or biological reefs), others that we commonly see the flotillas of reds that cling to the stalks of kelps, and the rock-hugging carrageenans. Laver (Porphyra) is widely known, and a mainstay of diets in Wales as well as Japan, where it is used to wrap sushi; many other reds have recently been identified as useful in antiviral and anti-cancer treatments. 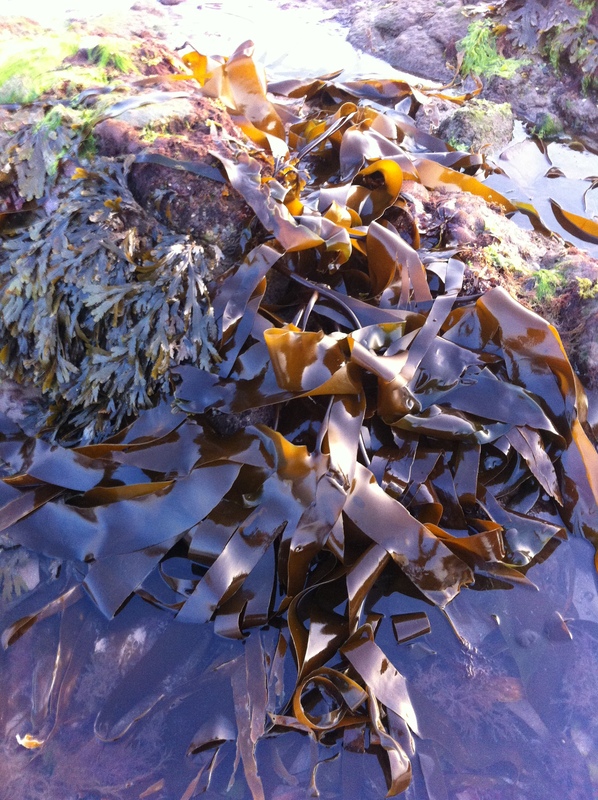 Brown (Phaeophyta)– includes the wracks and kelps. These are not ‘plants’ in the strict sense, although the giant kelps have evolved their anatomy in a virtually identical way to trees, with the Macrocystis growing to over 150 feet high and forming huge kelp forests that stretch for miles along the Southeast Asian and Pacific coasts. Alginic acid is found in the walls of kelp which has given man reason to harvest them for a long time (this was a major industry in Scotland up until Japanese cultivation took over), and more recently research has highlighted alginates as break-through agents in fighting persistent infectious diseases. Green (Chlorophyta) – over 8,000 species, 90% of which are freshwater. These are the original plants on Earth. We can identify them readily by their vivid green colour, such as the gutweed (Enteromorpha) that is often seen carpeting low flat shore banks, or the Sea Lettuce (Ulva latuca) that grows in shallow water. Both can utilise inorganic nutrients from land runoff, so are often found where freshwater streams flow in. Sea lettuce is a highly nutritious source of protein, fibre, vitamins and minerals and eaten in coastal cultures around the world. 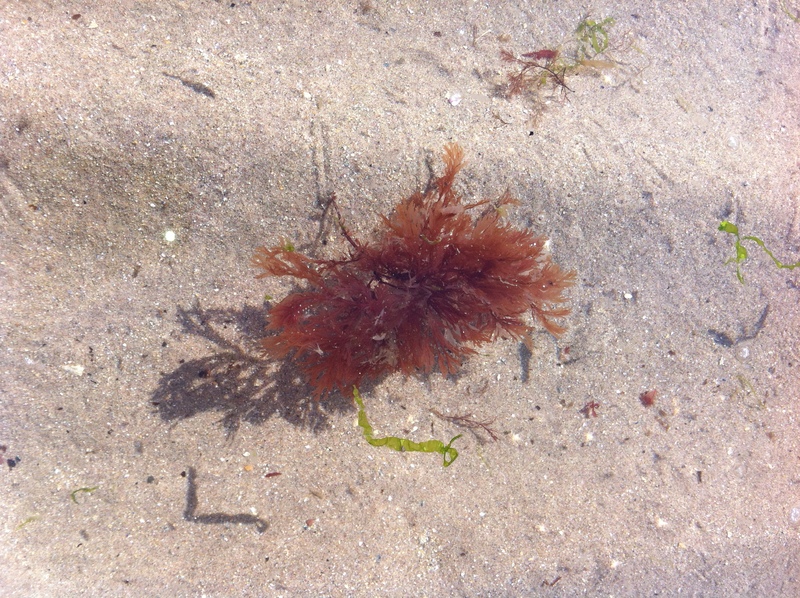 The green seaweeds are also favourite food of those rock pool grazers, sea urchins and sea slugs. Smaller algae – microscopic for the most part, with some that are actually cyanobacteria (and amongst oldest life forms on earth, being only 3.5 billion years young). 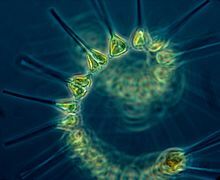 The slightly larger phytoplankton is known as the ‘pasturage of the seas’- the initial food that supports all ocean life; the tiny Dinoflagelattes are the ones that cause ‘red sea’ blooms (releasing toxins and asphyxiating other life forms), the exquisite Diatoms are truly kaleidoscopic microorganisms (see www.diatoms.co.uk for Klaus D Kemp’s diatom pictures), and did you know that the Coccolithophorids (algae that releases calcium carbonate) make up the white cliffs of Dover? The distribution of the differently across the tidal zones, from the high-tide mark to water measuring usually no deeper than 100 metres. The fucoids (also known as rockweeds) are found along the higher zones in descending horizontal bands starting with the little, oil-rich, Canaliculata pelvetia at the top, followed by Fucus vesiculosus and Ascophyllum nodosum, then Fucus serratus, F spiralis and F. ceranoides and then, with their feet always firmly underwater, the kelps, the Corallines and the Rhodophyta. And these zones of course create ecosystems that in turn support a variety of invertebrates and herbivores.